I have a real problem with people who find fault with table-cloth colours but don't say so to your face. Instead they post it on their blog for all the world to see. Recently, I was at a friend's house for tea and noticed they had chosen an unattractive flowery pattern on their table covering. It was quite hideous - old fashioned, in dull brown and orange colours and clearly manufactured in the 1970s. It made my stomach turn and completely put me off my food. Now the question is - did I go home without a word and describe this on my website for anyone to read? Of course not, I did the only decent thing and spent much of dinner explaining to my hosts exactly what I thought of it, with particular reference to the negative feelings it was generating in me towards the food they had prepared. Suffice to say, I no longer felt the need to write about it in public after that - I'm sure my hosts were relieved as I did have to threaten it a few times if they didn't allow me to finish my point! Anyway, glad you enjoyed the pie. Hello, I am a relative of the Senei couple. I recognised their tablecloth immediately from the picture above (second picture), as it is of both striking colour and spottiness. I think part of the issue with this particular meal was the contrast of the tablecloth colour with the foodstuffs on the plate e.g. 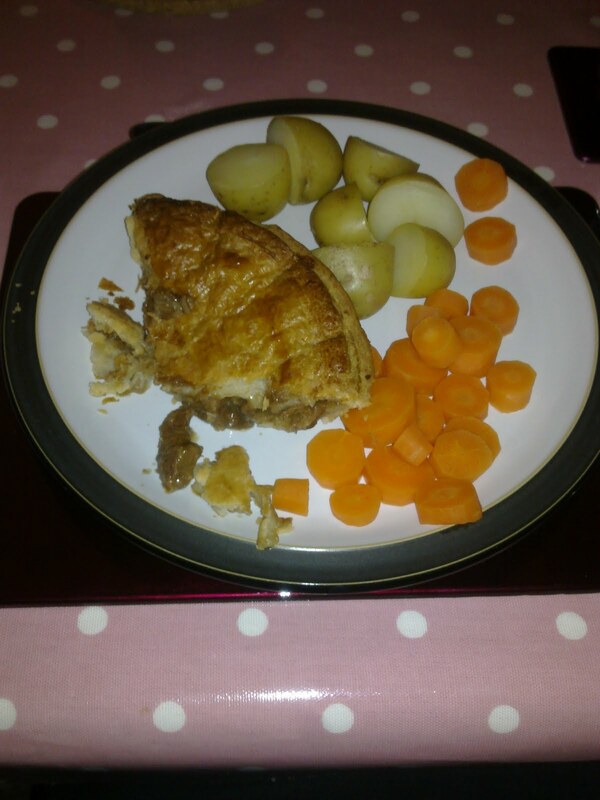 the pink quite irritatingly clashes with the orange of the sliced carrots. Had you just eaten salmon and strawberry ice cream the whole experience may well have been very different, and done less to call into question Mark's manliness. Even better if the salmon and strawberry ice cream had been covered in flecks of white, such as blobs of plain yogurt or small pieces of cauliflower. Moving on to the primary focus of your initiative, I would like to make a pie recommendation. Indeed I would go as far as to say that the recommendation I am about to make is a hearty one. So here is my hearty pie recommendation: A steak pie from the Chatsworth Farm shop in Derbyshire. I am confident that this pie would easily score 6 on your rating system (they are quite expensive). If you are interested, please let Mark and / or Louise know and we can make arrangements for you to come to my home in Sheffield. You would need to make your own travel plans but once here I can provide plates, knives, forks, etc. 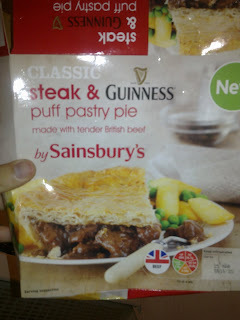 We would need to be quite precise with timings, in order to ensure maximum freshness - these pies are of the highest quality and aren't to be frozen or left standing around for hours on end, they are to be eaten as soon as possible after purchase. Ideally you will let me know the time of your arrival at my home and I will work backwards from there. It would be great if you could arrive just as the pie is coming out of the oven. On this tight schedule I of course won't be able to collect you from the railway station though. Are you OK with that? I look forward to hearing from you in the immediate future.